December 27…Bees in Bee Beard Log Hive have found a pollen source late in the year. Natural comb can be seen in the rear. 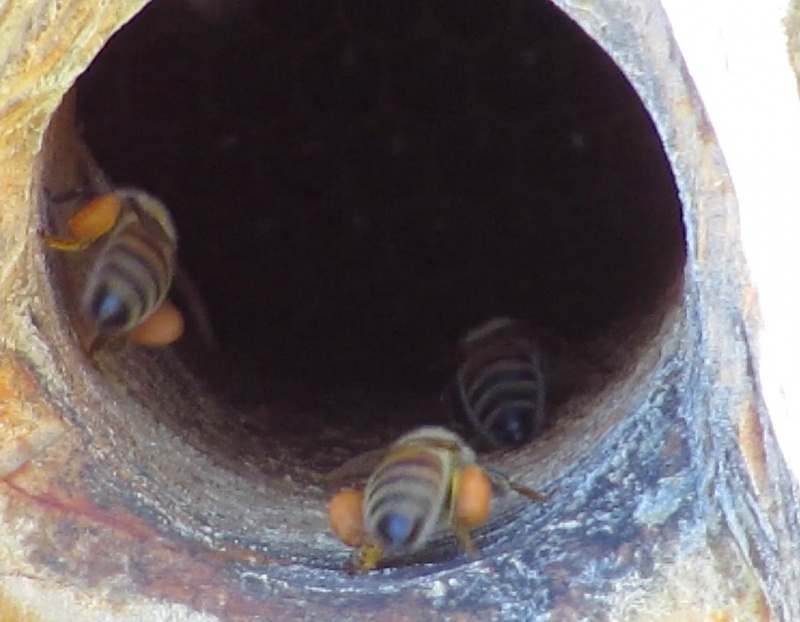 In the video, the bees can be seen entering the hive and moving downward in front of the comb. December 27…Warre Hive is being fed with a dry sugar mix consisting of green tea, chamomile tea, nettle leaf extract oil, cane sugar, and a few other little gems. 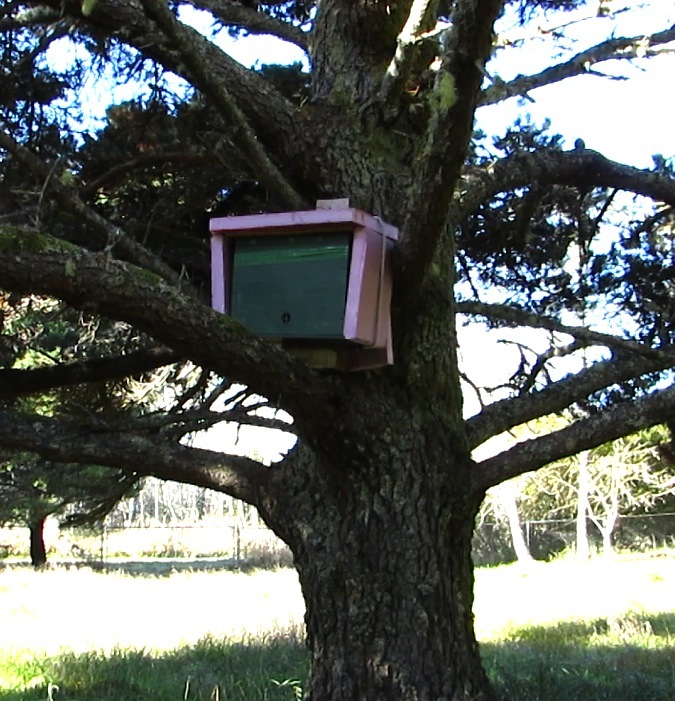 The sugar was placed on a 2″ x 2″ frame and positioned between the brood box and the quilt box, then sealed with red tape. I’m not real excited about feeding sugar to the bees. It’s possible that I won’t do that next year, but that’s what I said last year too. It’s the only hive that is being fed this year. December 27…Even this little hive was flying today. 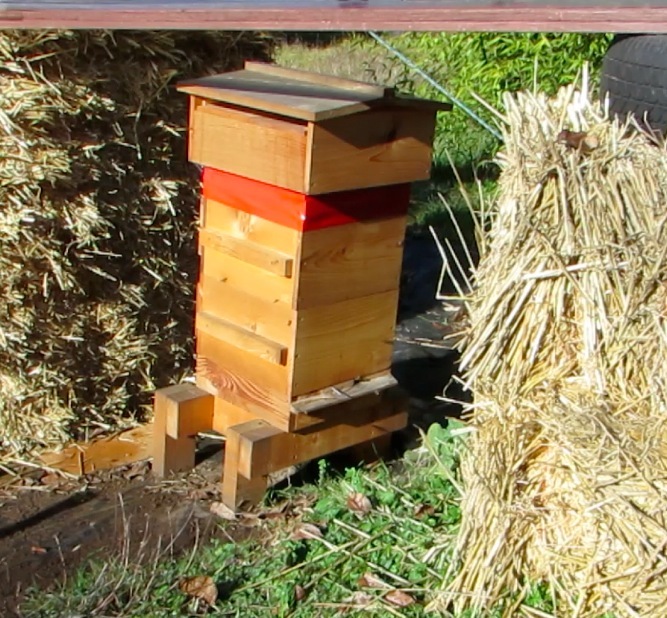 The pink insulation is meant to cut the cold wind, but it still lets the hive breathe through the quilt box on top. This short video shows the bees bringing in gobs of orange pollen. I loved the music with the bees. They were definitely strutting. I wonder what would have happened if you played a slow waltz or a lullaby? About the only thing I remember is the lecture about how the bees did a dance to communicate with fellow bees. So mustn’t play any lullabies or they would never get home to their honeys. Well, that was only to remove the entrance reducer and it had a handle on it. 🙂 I’m not quite to the point of ‘bare-handed’ beekeeping. I keep thinking about it, but if your hand has ever swelled up from the stings (as mine has) you think twice about rendering it useless if you use it in your job. Very cool 🙂 Great vid, the music is perfect.